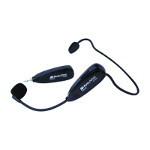 Remove the headband from the transmitter and you can use it as a handheld microphone, two microphones in one. Utilizing digital wireless technology, the S1697 operates in the 2.4 GHz range which is completely free of TV and radio interference. The S1697 out performs similarly priced VHF systems with better than CD quality digital audio and delivers dependable operation out to a distance of 49 feet or beyond with direct line of sight. 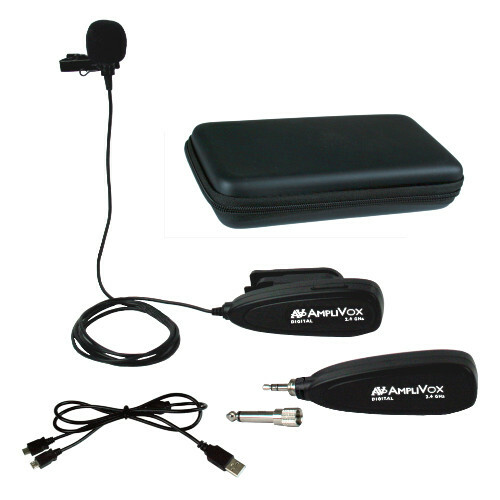 The AmpliVox S1698 is an easy to use and afford-able Universal digital wireless Lavalier microphone system. Its compact and lightweight design is a great solution for expanding your audio needs. Plug receiver into any audio device (microphone / line in jack) with a speaker and amplifier and start talking. Utilizing digital wireless technology, the S1698 operates in the 2.4 GHz range which is completely free of TV and radio interference. The S1698 out performs similarly priced VHF systems with better than CD quality digital audio and delivers dependable operation out to a distance of 49 feet or beyond with direct line of sight. Set up is a breeze with automatic syncing between receiver and transmitter. Internal, rechargeable lithium-ion batteries provide long lasting operation and easy charging via USB. The complete S1698 system includes the lavalier transmitter with specially designed microphone, plug in receiver as well as a dual USB charging cable for charging transmitter and receiver at the same time. Zippered storage case. Transmitter / Microphone Weight: 2.4 oz. The AmpliVox S1699 is an easy to use and affordable Universal digital wireless behind ear microphone system. Its compact and lightweight design is a great solution for expanding your audio needs. Plug receiver into any audio device (microphone / line in jack ) with a speaker and amplifier and start talking. Utilizing digital wireless technology, the S1699 operates in the 2.4 GHz range which is completely free of TV and radio interference. The S1699 out performs similarly priced VHF systems with better than CD quality digital audio and delivers dependable operation out to a distance of 49 feet or beyond with direct line of sight. 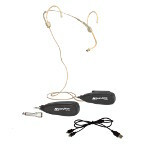 The complete S1699 system includes the headset transmitter with specially designed boom microphone, plug in receiver as well as a dual USB charging cable for charging transmitter and receiver at the same time. Transmitter / Microphone Weight: 1.0 oz.